Lasts up to 4 times longer than clay bars. For a flawless "showroom perfect" shine. Glides on and off easily for a slick finish. If dropped on the ground, simply rinse clean. 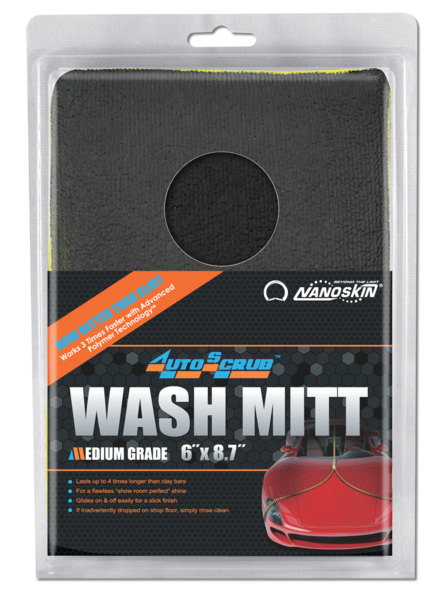 Nanoskin Autoscrub Wash Mitt works fast and achieves professional results with the new advanced rubber polymer technology, which replaces the use of clay bars. It safely and easily removes paint over spray, water spots, fresh tree sap, rail dust, and other bonded surface contaminants from the surface of automobile paint, glass, moldings and plastic. Unlike the clay bar, the Autoscrub Wash Mitt can be cleaned by simply rinsing off the accumulated contaminants with water. If you drop the wash mitt on the ground, no worries, just rinse the rubber clean and you're ready to keep using it. Easy glide comfort fit allows for sturdy and controlled handling, unlike clay bars where constant reshaping is required. Use only on clean, cool paint and out of direct sunlight. Do not work on the surface over 144 degrees. Use in an inconspicuous area for the first time in case of unexpected adverse effects on paint surface. Mix your favorite car wash soap into a bucket of water. Rinse surface to flush away loose dirt. Wash and rinse in sections with Autoscrub Wash Mitt using light pressure. Begin with the roof, and work the suds down to the hood, truck and sides. A 2-bucket wash system works best. One bucket for washing with the microfiber wash mitt side and the second bucket with heavier soap lubrication for the rubberized side. Always use the microfiber mitt side first to wash off dirt prior to using the polymer rubber side for bonded surface containment removal. Rinse with clean water. Dry with clean and soft towel or chamois. Sufficient lubrication is crucial to the Autoscrub system. Plain water is not an adequate lubrication. Autoscrub is not solvent resistant. Remove tar and grease before application. The Autoscrub has a protective coating to ensure stability within transportation. To break in the mitt, moisten the mitt with desired lubricant. Moisten a portion of window glass or other glass surface. Rub the mitt in circular motion against the glass for 30 - 60 seconds. You may see a white soapy foam. This is the protective sealant coming off. Don't use until the polymerized rubber is soft and slightly tacky. Cold temperatures may stiffen the mitt. Warm surface before using.